Cummins Highway is the only major connecting road between Mattapan Square and Roslindale Square, but its four lanes of fast-moving car traffic make it unsafe for bikes, forcing many of us who want to ride to instead choose another mode of transportation. With reconstruction coming soon to Cummins Highway between River St. and Harvard St., now is our chance to change that. 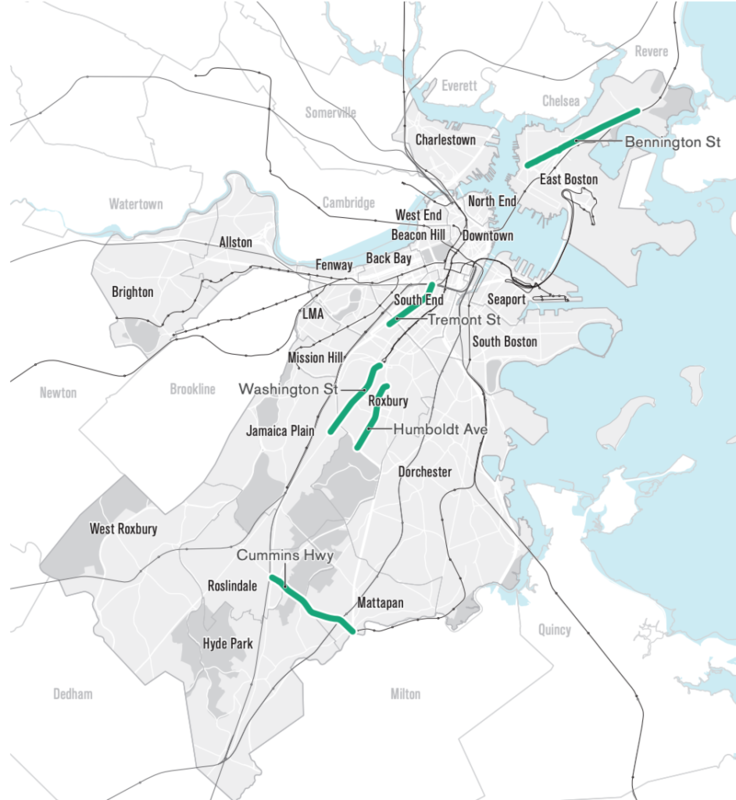 Thursday, April 11, 2019 // 6-8 p.m.
Go Boston 2030’s map of 15-year complete streets projects, including Cummins Highway. The good news about Cummins Highway is that this is a Complete Streets project, which is meant to put pedestrians, transit riders and bicyclists on equal footing with drivers. Plus, the City has already committed $4 million in funding over the next four years to make improvements for cyclists and pedestrians, and to improve the streetscape. However, there are no specific guidelines for the type of bike infrastructure, so we urge you to ask for physically separated bike lanes. Protected bike lanes are proven to dramatically increase ridership, and are the recommended type of bike lane for a high-volume, high-speed, four-lane road, according to MassDOT’s Draft Municipal Bike Resource Guide. The bad news is that the proposed limits of this project would still leave a gap in the bike network, stranding cyclists at Harvard St with no protected bike lanes in any direction, so we encourage you to advocate for the City to extend physically separated bike lanes all the way from River St. to Washington St. in Roslindale Square. The bike network plan in Go Boston 2030 shows Cummins Highway from Mattapan Square to American Legion highway as a 15-year project (see above image), so at the least this project should extend the additional half mile from where it is proposed to end (Harvard St.) to American Legion Highway, where cyclists can then find some safety in the existing painted bike lanes and, hopefully, in more protected lanes soon. A representative stretch of Cummins Highway, where bikes must contend with multiple lanes of traffic and parked cars. Show up and speak up! — Attend Thursday’s meeting and share your ideas for making Cummins Highway safer and more accessible for bikes. Submit feedback —If you can’t attend the meeting on April 11, email the lead Civil Engineer at jeffrey.alexis@boston.gov to let him know that you live/ride/work in the area and want to see physically separated bike lanes that connect to existing or planned bike network routes. Pleas cc: timothy.mccarthy@boston.gov and info@bostoncyclistsunion.org so we can measure our impact. Get involved in the FY20 Boston Bike Budget Campaign — As part of our budget campaign this year, we are asking District 4 City Councilor Andrea Campbell and the City to implement protected bike facilities on more of Cummins Highway, and to invest in finishing the protected bike lanes on American Legion and fix the missing flex posts. We hope you can join us to ride these roads with her on April 26 at 11am. You can also contact her about the Bike Budget and these corridors at andrea.campbell@boston.gov. We are still confirming logistics for April 26, so check our website, calendar and Twitter for final meeting place details, or email Eliza.